Today I’m taking a walk down memory lane to my first solo day trip beyond Paris. In November I spent a lovely day in Lille, the eleventh biggest city in France and the capital of the Hauts de France region (once separated into two regions: Picardie and Nord-Pas-de-Calais). Around ten miles from Belgium’s border, Lille is linked by train to Brussels, London, and Paris, making it a great city to add to your next European vacation! Lille was actually my first choice when I applied for TAPIF. Maybe you believe everything happens for a reason, or maybe you believe any experience is what you make of it. Whatever you believe, I’m grateful to be in Amiens where I have found family in my landladies, made lovely friends, and work in two incredible schools with the sweetest students. Plus, Lille is less than an hour and a half by train so I still have the opportunity to enjoy it! My day chez les ch’tis (ch’ti is a regional dialect in northern France and the word can also refer to the residents of the region) began as all days of travel must: avec un café. Any time I’m heading to a new city, I always research the best places to get a coffee. I chose Coffee Makers based on its stellar Google rating and was really happy with my experience. Any time I can get delicious coffee in a nice environment I’m a happy girl, and Coffee Makers delivered. 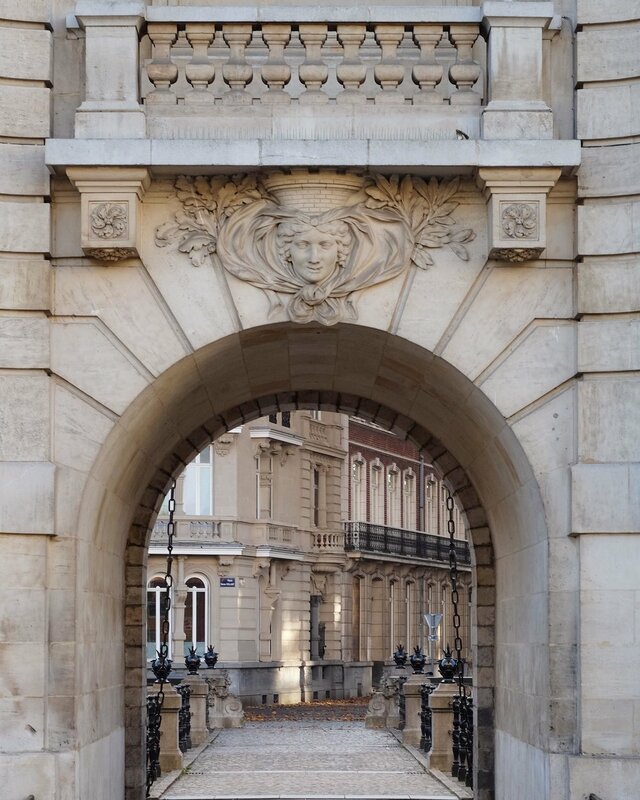 I walked south past the Beffroi de Lille (a UNESCO World Heritage site) to the Porte de Paris built in honor of Louis XIV when he conquered the city and made it part of France in the 17th century. Porte de Paris in Lille, France - I love the fall leaves scattered on the ground. As I headed toward the Palais des Beaux Arts (which has the second largest collection in France after the Louvre but is much more manageable to visit), I delighted in the fall leaves crunching beneath my feet. I remember being overcome with the feeling that my feet were made to explore, so grateful that my French dream actually came true. These feet were made for exploring. I got these Dune London shoes when Tony and I were in Copenhagen in 2017. They are some of my favorite shoes - stylish and comfortable. After hitting the Tourism Office (something I am now in the habit of doing because they usually have a free city guide + great souvenirs), I made my way north to Vieux Lille, the old part of the city. 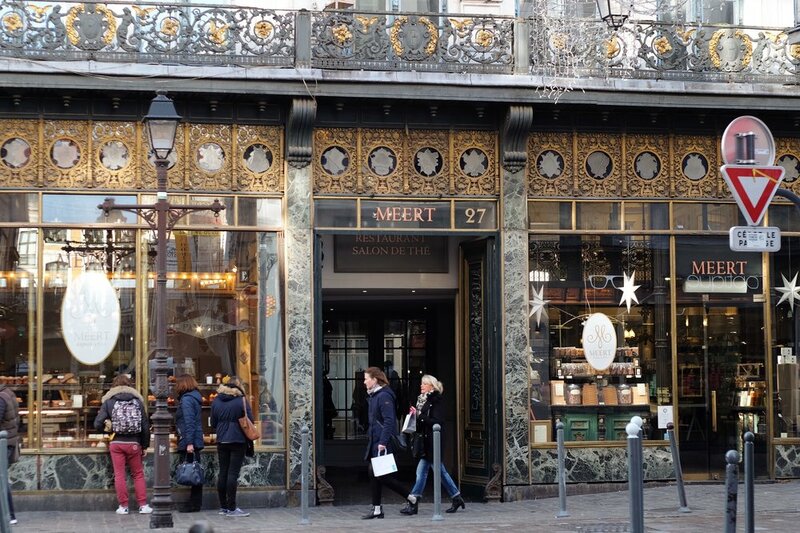 I treated myself to a nice sit down lunch at Méert (founded in 1761), and popped into the shop up front to buy a few gaufres (waffles) to snack on later (I chose one filled with vanilla and one filled with spéculoos). 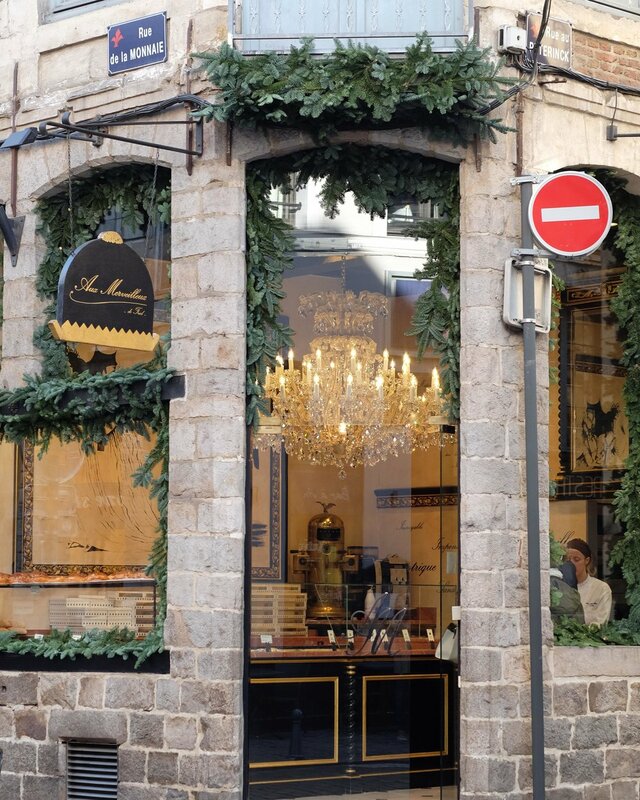 It was so fun to walk through and shop the narrow, winding streets of Vieux Lille where Christmas decorations had already begun to appear. I always like to see the cathedral in each city I visit, and I almost walked right past the Cathédrale Notre-Dame de la Treille. I’m so used to the traditional gothic cathedrals in France and that’s what I expected to see. While construction on Lille’s cathedral began in 1854, the incredibly modern façade was built in 1999. I didn’t take a photo but you can see the cathedral here. Towards the end of my day I headed to the Place du Théâtre, excited to check out the booksellers’ market held in the cloister of the Vieille Bourse, the old stock exchange building. Cook Kaffe was the perfect stop for an afternoon pause. I had passed the Scandinavian inspired coffee shop earlier in the day and was instantly attracted to it’s hyggley vibes. I took in one final view of the city before hopping on my train back to Amiens. Postcards are a simple, inexpensive souvenir. I buy at least one in every city I visit. Tony and I have some of our favorites framed and they are part of the travel gallery wall in our home. I think the foodie ones also make great kitchen art! The gaufre on the bottom card looks just like the ones I got at Méert. Merci for reading! Lille is a beautiful city that can easily be done in a day trip and has so much to offer.